Temperature: This element provides access to temperature, soil temperature layers 1–6, soil temperature unsaturated zone, and soil temperature saturated zone. Precipitation: This element provides access to precipitation, evaporation, infiltration, overland runoff, snow mass, snow melt, snow-covered area fraction, and snowfall. Humidity: This element provides access to specific humidity, relative humidity, and air pressure. Wind: This element provides access to north wind, east wind, wind velocity, and air density. Solar: This element provides access to shortwave surface, shortwave top of atmosphere, cloud cover, percent sunshine, emissivity, and albedo. The data are available in hourly, daily, monthly, and annual temporal resolutions. Data summaries, including average, maximum, minimum, standard deviation, and count, are provided for various elements. The LTPP Climate Tool is composed of three modules: Location, Country, and Map. (1) These modules are used to select and download the desired data. The location module allows the user to select the desired data geographically, while the country module allows the user to select data based on country and State/Province for any country in the world. The map module provides geographic information service (GIS)-based files for all of the MERRA data cells for a selected year. The search location bar allows the user to search for and access the required data for the geographic location by name. The user can also highlight one or more LTPP test sections by applying the filters on the left-hand side of the window and then using the single-point or area selection tool to highlight the data cell encompassing the LTPP test section(s). The country module allows users to select and extract data based on country and State/Province for any country in the world as shown in figure 2. The map module allows users to download GIS-based data files for all of the MERRA data cells for a selected data attribute and time frame. Files can be downloaded either in ESRI Shape File (*.shp) or Keyhole Markup Language (*.kml) format. The MERRA data selected using the location or country options can be downloaded for a specific time range, climatic attribute (temperature, precipitation, humidity, wind, or solar), and frequency (annual, monthly, daily, or hourly). These data can be obtained in a Microsoft® Excel (.xlsx) format file, a Microsoft® Access database (.mdb) format, or a Microsoft® SQL database (.bak) format. FHWA. LTPP Climate Tool, Federal Highway Administration, Washington, DC, obtained from: https://infopave.fhwa.dot.gov/data/climatetool, last accessed December 21, 2016. FHWA. (2016). 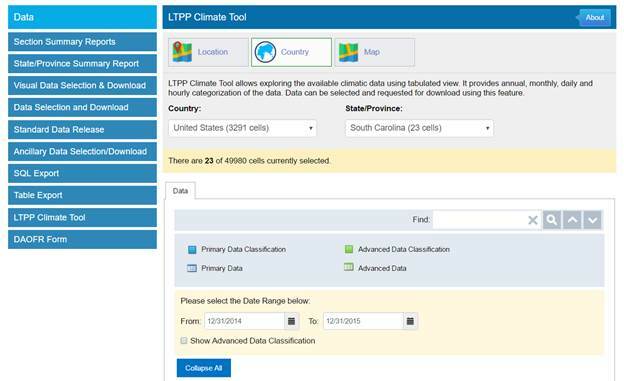 LTPP Climate Tool User Guide, Report No. HRT-17-012, Federal Highway Administration, Washington, DC. Federal Highway Administration. LTPP InfoPave™, Federal Highway Administration, Washington, DC, obtained from: https://infopave.fhwa.dot.gov/, last accessed August 8, 2016. Rienecker, M.M., Suarez, M.J., Gelaro, R., Todling, R., Bacmeister, J., Liu, E., Bosilovich, M.G., Schubert, S.D., Takacs, L., Kim, G., Bloom, S., Chen, J., Collins, D., Conaty, A., Da Silva, A., Gu, W., Joiner, J., Koster, R.D., Lucchesi, A M., Owens, T., Pawson, S., Pegion, P., Redder, C.R., Reichle, R., Robertson, F.R., Ruddick, A.G., Sienkiewicz, M., and Woollen, J. (2011). “MERRA: NASA's Modern-Era Retrospective Analysis for Research and Applications,” Journal of Climate, 24(14), pp. 3624―3648. NASA. (2012). MERRA: Modern-Era Retrospective Analysis for Research and Applications, Goddard Space Flight Center, Global Modeling and Assimilation Office, Greenbelt, MD, obtained from: http://gmao.gsfc.nasa.gov/merra, last accessed March 9, 2015. Schwartz, C.H., Elkins, G.E., Li, R., Visintine, B.A., Forman, B., Rada, G.R., and Groeger, J.L. (2015). Evaluation of LTPP Climatic Data for Use in Mechanistic-Empirical Pavement Design Guide (MEPDG) Calibration and Other Pavement Analysis, Report No. FHWA-HRT-15-019, Federal Highway Administration, Washington, DC. AASHTO. (2015). Mechanistic-Empirical Pavement Design Guide: A Manual of Practice, Second Edition, American Association of State Highway and Transportation Officials, Washington, DC. AASHTO. (2015). AASHTOWare® Pavement ME Design Software, 2.2 Build 2.2.4, American Association of State and Highway Transportation Officials, Washington, DC. 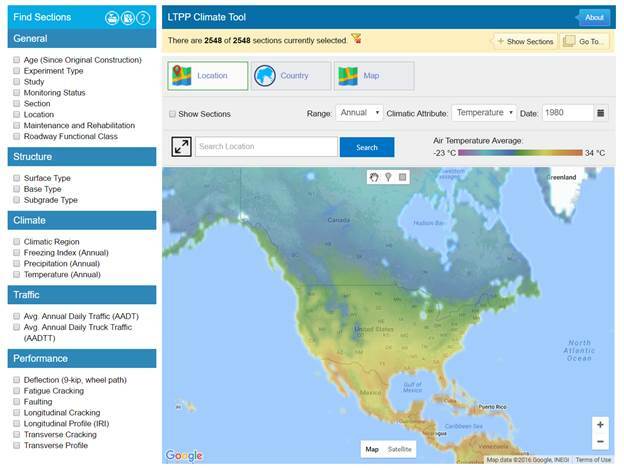 Availability―The LTPP Climate Tool can be accessed via the LTPP InfoPaveTM Web site at https://infopave.fhwa.dot.gov/ under the data tab. Key Words―MERRA, MEPDG, pavement performance, climate data, pavement design. Notice ― This document is disseminated under the sponsorship of the U.S. Department of Transportation in the interest of information exchange. The U.S. Government assumes no liability for the use of the information contained in this document. The U.S. Government does not endorse products or manufacturers. Trademarks or manufacturers’ names appear in this report only because they are considered essential to the objective of the document. Quality Assurance Statement - The Federal Highway Administration (FHWA) provides high-quality information to serve Government, industry, and the public in a manner that promotes public understanding. Standards and policies are used to ensure and maximize the quality, objectivity, utility, and integrity of its information. FHWA periodically reviews quality issues and adjusts its programs and processes to ensure continuous quality improvement.